After having lunch with some friends, I found a beautiful tea-house behind the restaurant. It’s probably the smallest I’ve ever seen. It is made from a huge barrel which used to have Miso-paste in it. The owner told me that his acquaintance was about to throw some of these barrels away since they had become too old to continue the storage of Miso-paste in it. 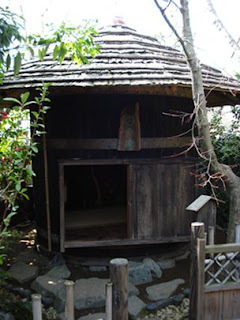 One barrel was made into a tea-house and another into a Machi-ai / waiting hut. The owner knew a carpenter who had some experience building and designing Chashitsu / tea house and they worked on the hut together. Inside there is only one Tatami mat, so I guess the room would only fit two or three people which makes it a very intimate. The window, the tana / shelves and the kakejiku / hanging scroll were all of miniature size to keep a balance in the Chashitsu (tea house).